Ask fellow campers about "Warfield Point Park" and nearby attractions. This park is right on the Mississippi but a little out of the way to get to. 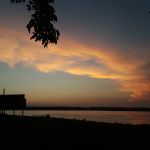 Good views of the sunset over the river and amenities for kids. But most of the sites are not level, and messy when raining. They advertise FHU, but only at 30 Amp sites. So, 50 amp rigs will need to use their dump station. No cable or internet. No one there to greet you, employee shows up later on to collect the $25 in cash. OK if you are a fisherman as they have a boat ramp. Good value for an overnight stay only. We camped at Warfield Point Park in a Fifth Wheel. This park is somewhat remotely located with no commercial facilities nearby. 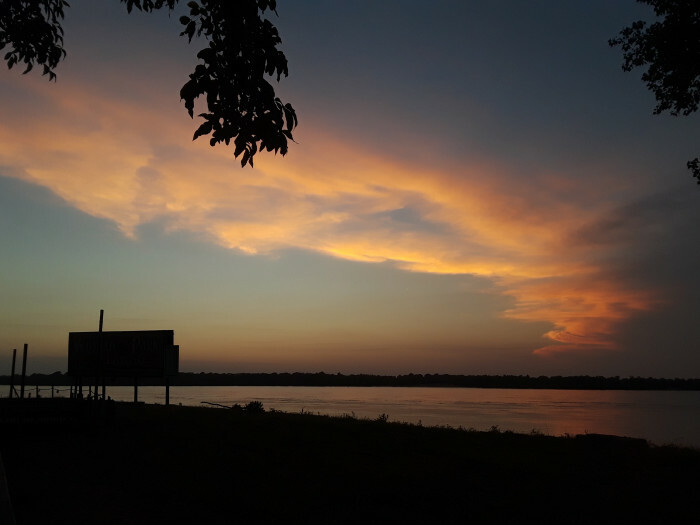 We love the view from this park the sunsets and love watching the push boats and the barges. We think at $25 it is a bargain price. Really big RV sites and really close to the Mississippi River. 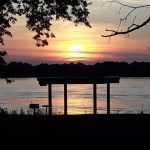 We like traveling the river road and we think this park is the best on the Mississippi River far as view and price. We ended staying here twice as long as we was and hope to come back thru in the fall. We add this parks to CG we love going to. The site was really big. I would recommend this place we plan on coming back. We camped at Warfield Point Park in a Fifth Wheel. World War II Japanese American Internment Museum in McGhee AR free also two interment camps in Jerome AR Relocation Camp and Rohwer Relocation Center Memorial Cemetery. Winterville (MS) Indian Mounds free. They have two Casinos and museums down town. We went out to eat once at Pizza Hut and McDonald in Lake Village. For a nice drive in Lake View drive down 144 the part in town is beautiful. We were disappointed because we called ahead to ask about availablilty and were never told there had been a rate change. According to their website, the daily fee is $15, $12 for seniors. When the park employee came around to collect the fee, we were charged $25. When I asked why it was so much I was told the fee changed on June 17 and the website had been changed to reflect that. Well, it hasn't. It's a decent park and had we been prepared to pay $25 ahead of time we probably would have stayed more than one night. As it was, we felt robbed since the website indicated a much lower price. All sites are back in only. Nice view of the river and barges going by. Interior roads are narrow and some corners are tight because of trees on either side of the road. Interior roads are only wide enough for a single lane of traffic. We camped at Warfield Point Park in a Motorhome. This County Park is a good value. There is good and bad to it. It is water and electric only (the water is definitely brown). Saw several campers with their sewer hoses out. Did see one draining their grey water, so I'm sure the others did too. Most campers were contract workers. The utilities worked fine. Satellite coverage was tricky with all the trees. Our site was fairly level although our asphalt pad had cracks in it. It rained while we were there and we had a lake at our site. Didn't really see any others that were as bad as ours. It was great seeing all the barges on the Mississippi River. They have a nice tower for viewing and a nice playground for kids. One of the big downfalls to us was the "shotgun blasts" we heard starting at 7 a.m. There is a rice mill close by and they fire off the shots to keep the birds away. It woke us up both mornings we were there and it goes until about 4pm. Very annoying. The road getting into the park is in bad shape. It does appear the park used to be really nice. It is great for a night or 2, but I can't see camping there much more than that. We camped at Warfield Point Park in a Fifth Wheel. Watching the barges on the Mississippi River was great for us. Arrived on a Sunday, no attendant was on site, but available by phone and gave instructions needed. Very courteous. Site was level and tree covered by the Mississippi River. Enjoyed the stay and will stay again. The road to get to the park is not well marked, take a left at the paper plant, don't let the surroundings sway you, its a great park, safe and quiet at night. Gates Locked. We camped at Warfield Point Park in a Motorhome. 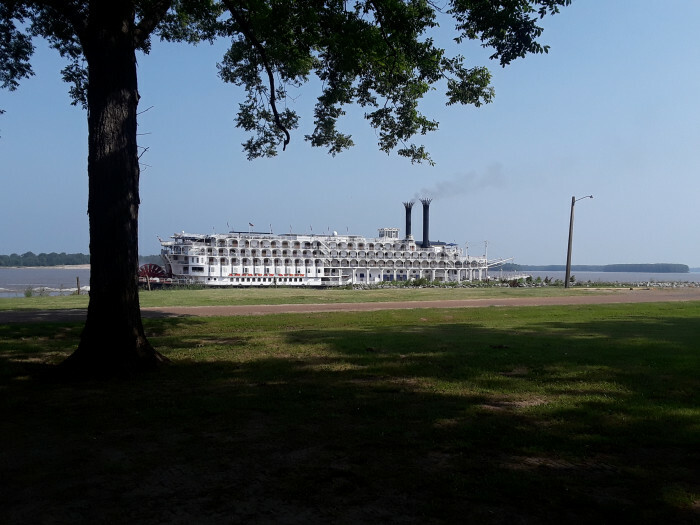 Great county owned park right on the banks of the Mississippi River. Wonderful place to watch the barge traffic on the river as they make a large curve in the river. Sites are large, shaded by large pecan trees and have electric and water. Good security in a gated park. If it had sewer hookups it would be even better. 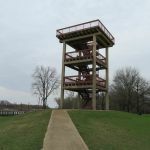 We camped at Warfield Point Park in a Travel Trailer. Great place to watch barge traffic on the Mississippi River. Good informational signage explaining the importance of the river and the impact of past flooding in the area. We also appreciated the security provided by a manned gate to the park and regular patrol support by the county sheriff's office. All of this for just $12. A real bargain and a great place to stay for a night or two. This is a pretty typical County Park-once very nice and modern but now somewhat run down due to lack of funds. We had to try 3 different spaces to find electric, water and a somewhat level pad. Worth what we paid and a real pleasant setting. The water in the restrooms was brown so we didn't use the shower. We camped at Warfield Point Park in a Travel Trailer. Beautiful view of the Mississippi! We were there during all the rains. Most sites didn't have flooding. Need to get used to brown looking water :) Close to shopping and restaurants. Really enjoyed ourselves. We camped at Warfield Point Park in a Travel Trailer. 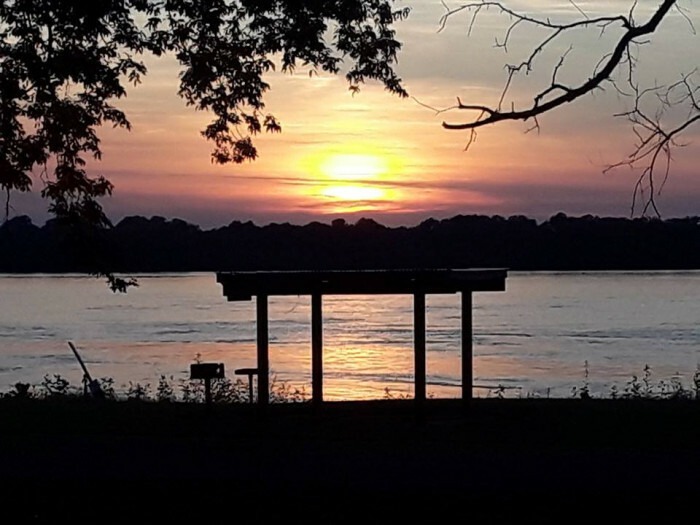 Wonderful county park, especially sites #3, 59, 61 & 63 that overlook the Mississippi River. These sites have water & elec, but no sewer (dump is available), but watching the barges and tug boats for a few nights beat the convenience. There are some interior sites with full hookups for longer stays. Office closed when we arrived but friendly staff came in the morning. Park was clean. We thought a county park was a great use of land that floods some years as it is on the river side of the levee. Large rig friendly. We camped at Warfield Point Park in a Motorhome. The Museum about the 1927 flood is small but good - be sure to call ahead as they don't keep regular hours, but love to open for you. Doe's Eat Place was recommended as unique setting but delicious steaks. They were, but beware also very expensive. Winterville Mounds were interesting. Great views of barges on the Mississippi. Climb the tower to see even more of the river. The staff was wonderful! The roads and sites were level and clean. We camped at Warfield Point Park in a Motorhome. Beautiful location! Right on the Mississippi River. Many large trees. Only a few others here on a Wednesday night. No one was at the entrance gate the afternoon we pulled in nor when we left in the morning even though the sign said it was office hours. So we couldn't find anyone to give our money to. I think they honor Senior pass so it wouldn't have been much. Seemed safe here. Closeby Greenville MS is another story. Be careful. We camped at Warfield Point Park in a Motorhome. It looks like this was once a nicer-looking facility than it is now. there's a bit of a run-down appearance to things. It's a pleasant setting with lots of old, large trees for shade, and all grass below - no underbrush. The staff is great. the day manager checked us in at the office and then escorted us to our river-front site. The electric hookups leave a lot to be desired. there was no breaker on the 30-amp outlet so you have to plug in "hot". There was also a 50-amp outlet which did have a breaker, but all the wiring for it was exposed. Bathrooms are kept locked. one needs to put down a refundable $5 deposit to get a key. It's a great place to watch all the barge traffic up and down the river. We camped at Warfield Point Park in a Motorhome. Rate was senior discount. Called campground while enroute to verify address, was given an address the Garmin accepted and directed to front gate. Asphalt drives and sites. Discussed open sites with host and provided with several possibilities for big rig. Host was very helpful and accommodating. No problem negotiating park roads to site. 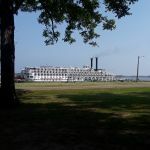 Accepted a 50A/Water site with rear view to Mississippi River. Host OK'ed reversing a back-in to drive-in for windshield view of river and barge traffic. Had to extend electrical and water to reach, use couple of boards for front wheels to level. We were here in off-season so lots of open sites, very quiet other than nearby power generating plant. No cable but several local channels via coach antenna. AT&T cell and Verizon broadband had good signals. Dump station was convenient as we left park. Our stay was just overnight but will definitely stay here again, hopefully for several days next time. We camped at Warfield Point Park in a Motorhome. This was a nice campground. We were here four days and got one of the five sites with a sewer connection. Beginning with our first conversation, the young man in charge was friendly, helpful and effective. The paved road was so beaten up, while we were here, the county came in and dumped dirt on it and made it a dirt road (probably for the upcoming festival). We noticed the power dipped under 110. Water was interrupted one day; power the next by contractors preparing for the festival. But that's one of those things. A number of semi-permanent residents have the other four sewer connections. We enjoyed the park, the quiet, the river. When we're back in that part of the country we'll definitely stay here again. We camped at Warfield Point Park in a Motorhome. Huge sites right by the Mississippi River. Only about 8 sites were occupied when I was there. Extremely quiet except for a little tug boat noise when pushing barges up river. Verizon phone service was spotty. As you would expect there were lots of trees but I was able to get the portable Direct TV dish locked in from a site closest to the river. I would stay here again. We camped at Warfield Point Park in a Motorhome. Are you affiliated with Warfield Point Park ?